When a car is producing blue smoke it means oil is getting into the combustion chamber for one reason or another and being burnt along with the normal gasoline. This creates a blue colored smoke which is passed down the exhaust system and then exits the car along with normal gases. A blue smoke condition is typically present when the engine is under load and at first start up after sitting for a few hours. As you can imagine engine oil is present all welcome throughout the engine as it lubricates internal parts. The combustion chamber is the exception. This chamber must stay as oil free as possible to help allow the fuel to burn as clean as possible. There are nine main causes that can allow oil to enter the chamber. This repair can vary from one extreme to the next for example if the engine oil is too full the repair means letting some out to obtain the correct level should be around $25.00 (US) go ahead and change the oil while you are at, if its time. If the oil drain back passages in the cylinder head are plugged filling the valve train galley the valve covers will need to be removed and the engine cleaned and flushed which will run about $400.00 (US). If the engine has high mileage or extreme usage the pistons rings can be worn out meaning the engine will need to be replaced which can run between $2500 (US) and $7000.00 (US) depending the type of engine. When the engine oil level becomes very low it can cause the oil to become overheated and lose its viscosity. When this happens the piston oil control rings stop working because the oil is to thin and it washes by the rings and into the combustion chamber. To fix this problem check the engine oil level. Also this condition can occur when the oil level is normal if the engine is under heavy load for a long period of time. This is why some heavy duty trucks are equipped with oil temperature gauges. If the engine is too full it can cause the piston oil control rings to be overloaded causing the same effect as overheated oil. Lift the hood and locate the engine oil level dipstick which usually has a yellow handle on it to distinguish it from other components. With the engine off and the car on level ground remove the dipstick and wipe it clean, then reinsert and remove to observe the level. The level should be between the FULL and ADD marks. Engines are designs with a crankcase ventilation system of some kind to allow internal crankcase pressures to dissipate. This system can be built into the valve cover using an internal baffle system or the job can be done by the PCV valve (positive crank ventilation) and a breather. Both are typically found near the top of the engine or under the intake manifold on some four cylinders. 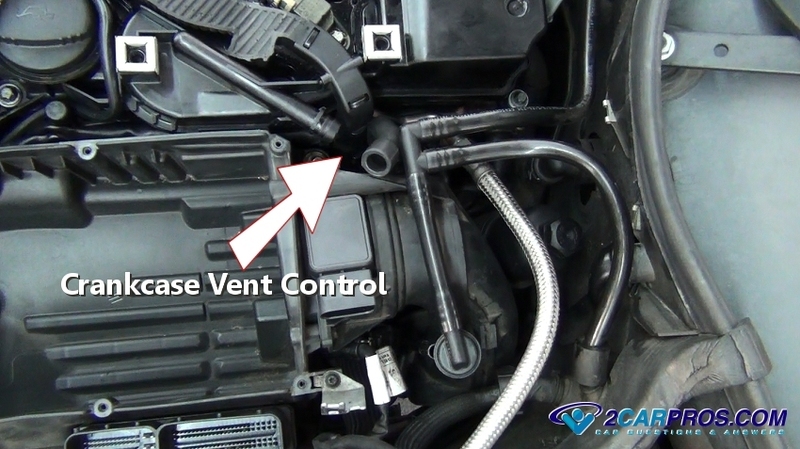 Look for broken or disconnected hoses and remove and check the PCV valve. Shake it back and forth to make sure it rattles lets you know it is working. 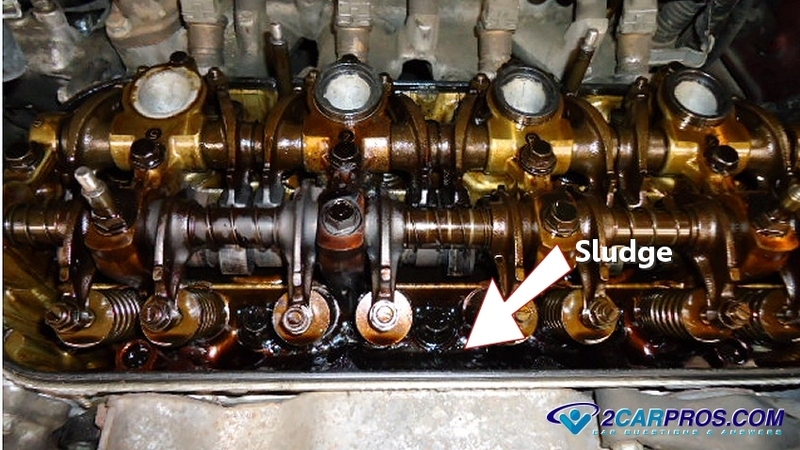 Due to poor maintenance sludge can build up inside the engine's cylinder head not allowing the lubricating oil of the valve train to drain successfully back into the crankcase (oil pan). As a result the oil fills the cylinder head forcing oil down the intake and exhaust valve stems (past the seals) and into the combustion chamber or directly into the exhaust port (fire). To check for this condition the valve covers must be removed for inspection. If sludge is found the drain back holes then must be cleaned and the sludge flushed down through the oil pan and out of the engine. After the repair it take about 2 to 4 days before the remainder of oil on the valve stems to dry up. Valve stem seals are designed to control the amount of oil that is allowed to lubricate the valve stems inside the cylinder head. Both intake and exhaust valve are equipped with these seal and when they wear or get over heated they can allow too much oil to travel down into the combustion chamber much like when the cylinder head drain back hole plug up. These seals can be changed while the cylinder head is still on the car in most cases. The top two piston rings are design to contain the combustion of the engine while the third ring down controls the engine oil. As an engine wears the integrity of this seal becomes comprised allowing both combustion to escape (blow-by) and engine oil to enter the combustion chamber. This can typical be tested by doing a compression test and visually checking for oil on each of the spark plugs. It best not to replace the piston rings due to the irregular shape of the cylinder bore, (the problem will be worse, round ring into an oval hole). Replacement engines can be obtained by the dealer or at a independent rebuilder, call for prices and go with the best warranty.